HouseKeeping Resumes are the best way to get the job interview for a housekeeping job. With hospitality and other sectors are in huge demand of housekeeping jobs. And, if you taking your chance for a housekeeping job, then we have Housekeeping resumes to get you started. A housekeeper can have many titles and some of the few titles are HouseKeeping, Executive HouseKeeper, HouseKeeper/Room Attendant. At BFWR, We always keep our readers updated with resume related articles. If you are new, then you can read How to write a resume. If you already have the idea on creating resume then you can look further on the tips that make the resume work. We also have a great collection of resume/CV and a practical guide on how to build a cover letter that works! And, if you want to automate the process of resume building, check the free resume builders. Let’s move on to the housekeeping resumes. These resumes are handpicked so that they are best suited for the people who are looking for jobs. So, what is the role of HouseKeepers? Housekeepers are the new age warriors that keep the environment clean. They do their duty in smaller chunks and on regular intervals. They also work on the request of the guest and takes care of their needs if needed. Some housekeeping jobs also requires taking care of cooking and laundry section. They are also responsible for sanitizing the place and keeping it free from any form of diseases that happens due to non-cleaning of the surroundings. The housekeepers are also responsible for working without disturbing the other workers or patients in the hospital or any other organization. The work hours needs to be flexible and there would be no reason to disturb others. If you are looking for a housekeeping job, then it is always a good idea to have a housekeeping cover letter. We have already linked how to create a cover letter that works — have a look on how to approach the problem. 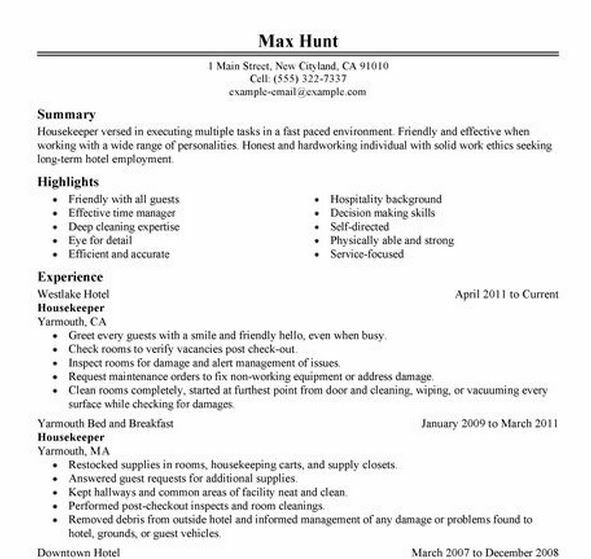 Let’s dive deep into the list of amazing housekeeping resumes. Do you have anything to add to the story? Comment below and let us know!